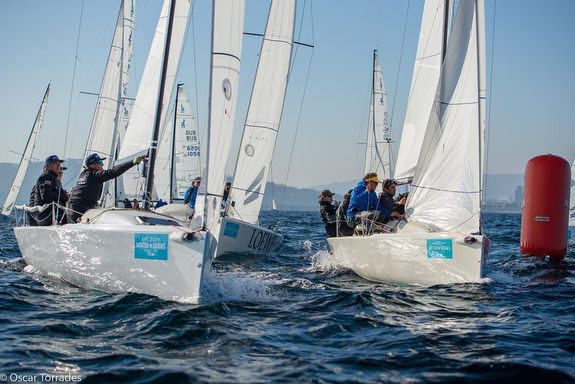 (Barcelona, Spain)- Sixteen boats sailed the 2018- 2019 winter series in Barcelona, Spain; the event was hosted by Real Club Náutico de Barcelona. The sixteen teams hailed from across Europe- Cyprus, Great Britain, Spain, Poland, Portugal, Russia, and Italy. Winning the overall winter series was the Russian crew of AMAIZ SAILING TEAM with Egor Terpigorev, Sergey Dobrovolskiy, Victor Serezhkin and Slava Martynov from Cyprus Yacht Club. Their winning record was 5-1-1-4-1-1-10-7 for 20 pts. Tony Hayward’s SERIOUS FUN from Great Britain, skippered by Mark Lees from Royal Thames YC, was DSQ’d in the last race to lose the regatta by just 1 point. For Hayward’s team, it was serious training for the 2019 J/70 World Championship that will be hosted in Torquay, England. The balance of the podium and top five were all hot, fast Spanish crews. Third was Pablo Garriba’s RCN Barcelona team on TENAZ with 26 pts. Fourth was another Spanish crew on Luiz Martinez Doreste’s FORTY-FIVE with 30 pts. Fifth place went to David Marco’s Spanish crew on REBUFF from Real Club Nautico Barcelona with 36 pts. In the J/80 Winter Series, Marc de Antonio's J/80 BRIBON MOVISTAR won the series handily. Taking the silver was MIKAKU, sailed by Rosa Artigas (also top woman helm) and Luis Corbella. Rounding out the podium in the bronze position was AKEWUELE, skippered by the second woman helm- Silvia Ravetllat. 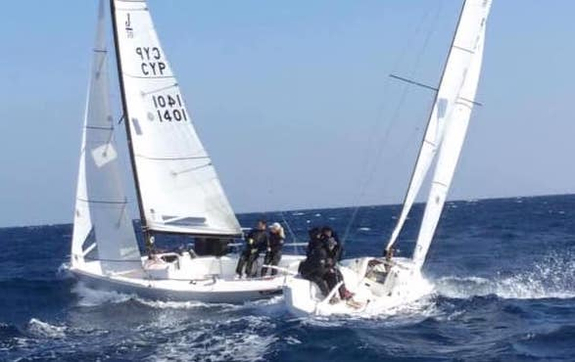 For more Barcelona J/70 & J/80 Winter Series sailing information Add to Flipboard Magazine.